Cost is something that can be classified in several ways depending on its nature. One of the most popular methods is classifying them into fixed costs and variable costs. Fixed costs do not change with increases/decreases in units of production volume, while variable costs are solely dependent on the volume of units of production. Fixed and variable costs are key terms relevant in managerial accounting that are used in various forms of analysis of financial statementsAnalysis of Financial StatementsHow to perform Analysis of Financial Statements. This guide will teach you to perform financial statement analysis of the income statement, balance sheet, and cash flow statement including margins, ratios, growth, liquiditiy, leverage, rates of return and profitability. See examples and step-by-step instruction. The first illustration below shows an example of variable costs, where costs increase directly with the number of units produced. In the second illustration, costs are fixed and do not change with the number of units produced. 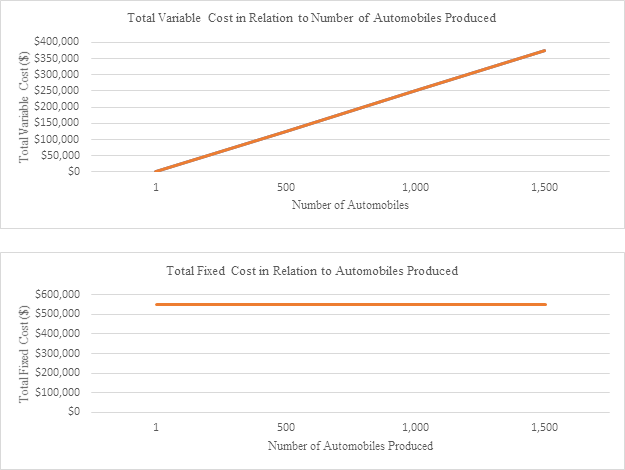 Graphically, we can see that fixed costs are not related to the volume of automobiles produced by the company. No matter how high or low sales are, fixed costs remain the same. Variable costs, on the other hand, show a linear relationship between the volume produced and total variable costs. Launch our financial analysis courses to learn more! While financial accounting is required by law and mainly performed to benefit external users, managerial accounting is not required by law and is done to provide useful information to people within an organization, mainly management, to make better internal business decisions. Let’s stay that XYZ Company manufactures automobiles and it costs the company $250 to make one steering wheel. In order to run its business, the company incurs $550,000 in rental fees for its factory space. Let’s take a closer look at the company’s costs depending on the company’s level of production. Classifying costs as either variable or fixed is important for companies because by using the total variable costs and fixed costs, companies can assemble a financial statement called the Statement/Schedule of Cost of Goods Manufactured (COGM)Cost of Goods Manufactured (COGM)Cost of Goods Manufactured (COGM) is a schedule showing the total production costs during a specific period of time. See COGM formula & examples in this guide. COGM is the total costs incurred to manufacture products and transfer them into finished goods inventory for actual retail sale. This is a schedule that is used to calculate the cost of producing the company’s products for a set period of time. The COGM is then transferred to the finished goods inventory account and used in calculating the Cost of Goods Sold (COGS)AccountingOur Accounting guides and resources are designed as self-study guides to learn accounting and finance at your own pace. Browse hundreds of articles on important topics such as the income statement, balance sheet, cash flow statement, depreciation methods, how to link the 3 statements, debits & credits, journal entries on the income statement. By analyzing variable and fixed cost prices, companies can make better decisions on whether to invest in Property, Plant, and Equipment (PPE). For example, if a company incurs high direct labor costs in manufacturing their products, they may look to invest in machinery to reduce these high variable costs and incur more fixed costs instead. These decisions, however, also need to consider how many products are actually being sold. If the company invested in machinery and incurred high fixed costs, it would only be beneficial in a situation where sales are high to the extent that the overall fixed costs are cheaper than the total labor costs had the machine not been purchased. If sales were low, even though unit labor costs remain high, it would be wiser to not invest in machinery and incur high fixed costs because low sales multiplied by high unit labor cost would still be lower than the overall fixed cost of the machinery. The volume of sales at which the fixed costs or variable costs incurred would be equal to each other is called the indifference point. Finally, variable and fixed costs are also key ingredients to various costing methods employed by companies including job order costing, process costing, and activity-based costing.